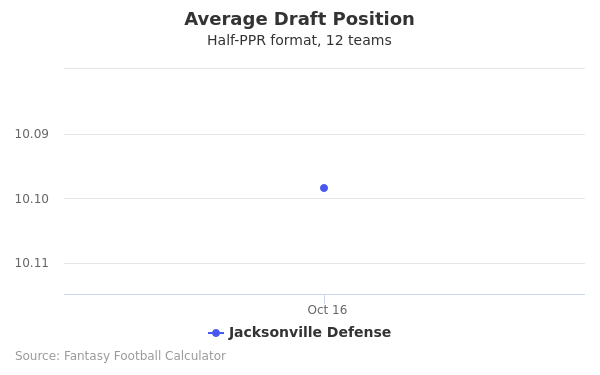 Jacksonville Defense's fantasy value is measured by his average draft position (ADP) in fantasy football mock drafts. 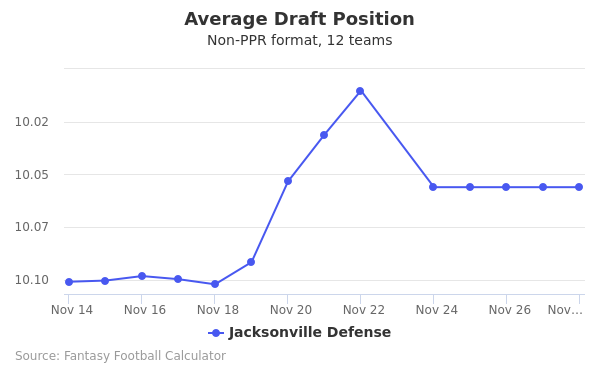 In recent drafts, Defense's current ADP is 10.11, which indicates that his fantasy outlook is to be the 11th pick of the 10th round, and 118th selection overall. 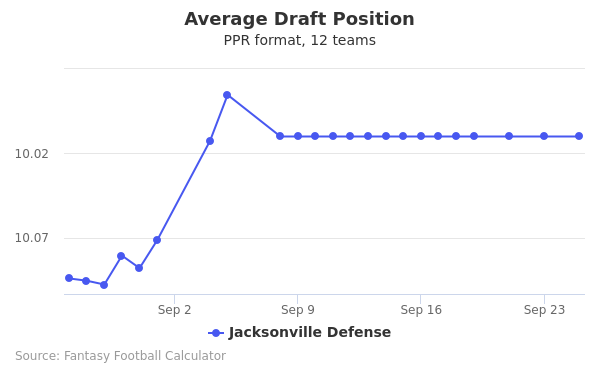 The code below will display a graph that updates every day to show the ADP data for Jacksonville Defense for the past 30 days in 12-team PPR leagues. Draft Jacksonville Defense or Lamar Jackson? Draft Delanie Walker or Jacksonville Defense? Draft Jacksonville Defense or John Kelly? Draft Geronimo Allison or Jacksonville Defense? Draft Jacksonville Defense or Josh Allen? Draft Jacksonville Defense or James Washington? Draft Jacksonville Defense or Jaylen Samuels? Draft Greg Zuerlein or Jacksonville Defense? Draft Houston Defense or Jacksonville Defense? Draft Anthony Miller or Jacksonville Defense? Draft Isaiah Crowell or Jacksonville Defense? Draft Jacksonville Defense or Rex Burkhead? Draft Jacksonville Defense or Mike Davis? Draft Jacksonville Defense or Minnesota Defense? Draft Jacksonville Defense or John Brown? Draft Jacksonville Defense or Nyheim Hines? Draft Dak Prescott or Jacksonville Defense? Draft Curtis Samuel or Jacksonville Defense? Draft Jacksonville Defense or Kaimi Fairbairn? Draft Jacksonville Defense or Kenny Stills? Draft Jacksonville Defense or Mitch Trubisky? Draft Dede Westbrook or Jacksonville Defense? Draft Cleveland Defense or Jacksonville Defense? Draft Ito Smith or Jacksonville Defense? Draft Jacksonville Defense or Robert Foster? Start Jacksonville Defense or Lamar Jackson? Start Delanie Walker or Jacksonville Defense? Start Jacksonville Defense or John Kelly? Start Geronimo Allison or Jacksonville Defense? 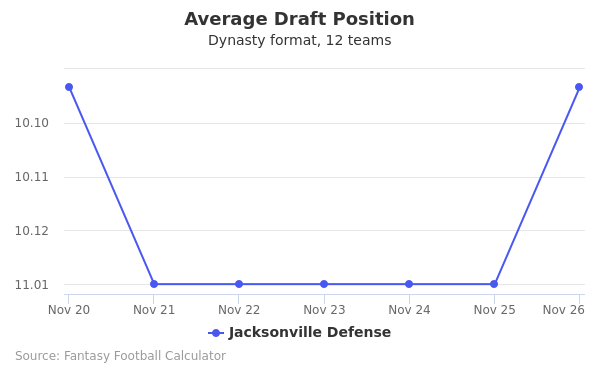 Start Jacksonville Defense or Josh Allen? Start Jacksonville Defense or James Washington? Start Jacksonville Defense or Jaylen Samuels? Start Greg Zuerlein or Jacksonville Defense? Start Houston Defense or Jacksonville Defense? Start Anthony Miller or Jacksonville Defense? Start Isaiah Crowell or Jacksonville Defense? Start Jacksonville Defense or Rex Burkhead? Start Jacksonville Defense or Mike Davis? Start Jacksonville Defense or Minnesota Defense? Start Jacksonville Defense or John Brown? Start Jacksonville Defense or Nyheim Hines? Start Dak Prescott or Jacksonville Defense? Start Curtis Samuel or Jacksonville Defense? Start Jacksonville Defense or Kaimi Fairbairn? Start Jacksonville Defense or Kenny Stills? Start Jacksonville Defense or Mitch Trubisky? Start Dede Westbrook or Jacksonville Defense? Start Cleveland Defense or Jacksonville Defense? Start Ito Smith or Jacksonville Defense? Start Jacksonville Defense or Robert Foster?